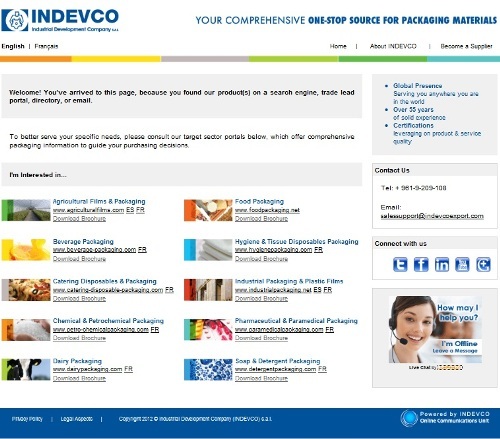 INDEVCO Group Product E-catalogue, www.indevcoexport.com, has now shifted to a simplified landing page, directing visitors to packaging sector portals and product pages. Now, customers and prospects can locate targeted product information & specifications under their specific sector and find guidance to address packaging needs. Moreover, sector portal visitors can gather all necessary information, interact through online live chat with INDEVCO representatives for any inquiries, and submit requests for quotes (RFQs) directly, which are processed by INDEVCO Lead Generation Unit within 48 hours from receiving requests. The portals offer comprehensive product-based brochures and present product specifications and images, showing packaging structure and materials. The ten sector portals also keep visitors in-tune with sector, company, and product related news by following INDEVCO social media channels including: Facebook, Twitter, LinkedIn, YouTube, and Google+.